Our last wedding of the year. I’m still completely blown away by the season we had and closing it out with Maria + Matt made it so, so sweet. 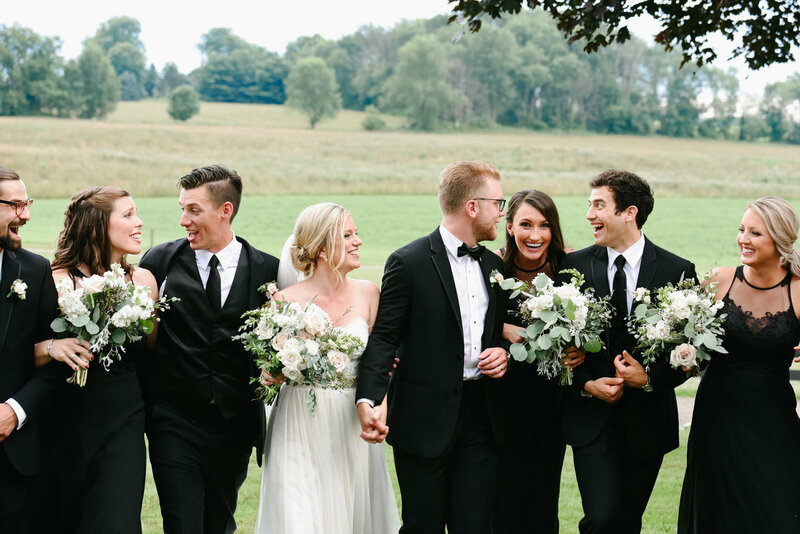 We met these two as Maria was a bridesmaid in Lauryn + Chucks wedding at Brookside Farm this past July. We instantly fell in love and when they asked us to capture their day I swear we jumped up and down! We’ve said it before, but the relationships we’ve built through this business are what truly makes it all worth it. We started the day at Marias house in Medina with her and her girls as they got ready, had some snacks and watched old episodes of Keeping Up With The Kardashians (these girls are my soulmates slash dream team). Everyone was so cute in their matching robes and Marias details were literally unreal. I had to drag myself away because I could have spent hours and hours rearranging and playing with everything. Maria gifted her bridesmaids fur to go with their dresses and the off-white one that she paired with her dress left me totally speechless. After everyone was ready, we hopped on the limo and headed to the church. They were the last couple ever to be married in their Parish which was super special. After they made the whole thing official, we stopped at The Square in Medina for some bridal party shots. The center was all decorated for the holidays and we even marched on top of a parking deck! Their reception was at Blue Heron and it was SO MUCH FUN. I don’t think we’ve ever shot so many pictures at a reception but this crew knew how to have a good time. We can’t thank our couples enough for such an incredible year and we’re so excited to share this last wedding with you. Congratulations to the new Mr + Mrs Meadows. We completely adore you two. Leave the bride + groom a little love. If they receive 20 comments on this post, we’ll gift them an enlargement of their favorite photo, on us! Looks like a crazy event! Fantastic pictures Twenty Two Photo Team! We had a blast just going through them today! LOVED looking through these photos! It was such an amazing day! How could you ever pick a favorite?! So many beautiful moments captures! Absolutely stunning!! So obsessed with these!!! Thank you Sam and Ronnie for everything you did to make our day so perfect and special! Love you guys! Thank you Sam and Ronnie! The pictures are amazing!! What a GORGEOUS Bride. The entire day looks amazing! Super excited for this couple.. these pictures are phenomenal! Wow what a cute couple ! These are so good! What a wonderful day! Gorgeous bride and groom! Love these photos!